Now the lightning-rod Baptist preacher from Georgia would be addressing the students, faculty, and staff of what was then called Monmouth College in a new phase of his civil rights campaign. The college was predominantly white at the time, set in a conservative county and dealing with its own issues of race and discrimination, though nothing on the level of what was happening in the South. People who attended King’s speech that morning say students were generally accepting of minorities and looked forward to King’s visit. Delivered in Monmouth College’s Boylan Gymnasium on October 6, 1966. Read the transcript of his speech. individuals at the highest levels of the federal government thought King had communist sympathies and were monitoring his activities and listening to his phone calls, according to The Martin Luther King Jr. Research and Education Institute at Stanford University. The Boyntons remember hearing jeers when King took the stage. The New York Times reported—and people who were there remember—a Republican Monmouth County Freeholder and Monmouth College trustee, Marcus Daly, “booing and hissing” at King as he spoke. 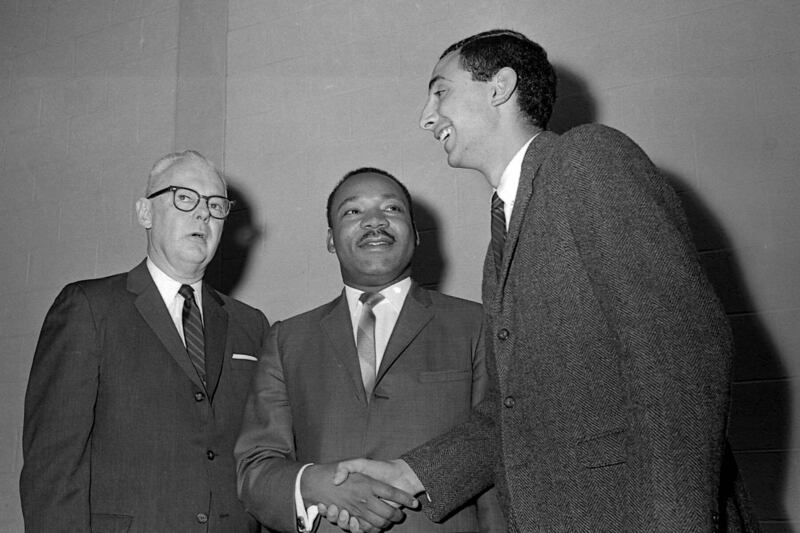 Left to right: William G. Van Note, president of Monmouth College from 1962–1971; Martin Luther King Jr.; Michael Dadd ’68, president of Monmouth’s student union council in 1966. In a way, King’s visit to Monmouth was a return to his ministerial roots. From 1948 to 1951 he attended Crozer Theological Seminary in Upland, Pennsylvania, and, according to the Courier-Post, routinely crossed the Delaware River to visit a row-house in Camden. In the intervening years, King rose to prominence through his advocacy: meeting with presidents; publishing books, letters and sermons; elevating the national consciousness; participating in the Bloody Sunday march in Selma, Alabama. With King at the vanguard, the civil rights movement had secured major victories with the march on Washington in 1963, the Civil Rights Act in 1964, and the Voting Rights Act in 1965. When King visited Monmouth, says Greason, he was “at the peak of his power.” He had started to make the connection between race and poverty and, more broadly, militarism and war. 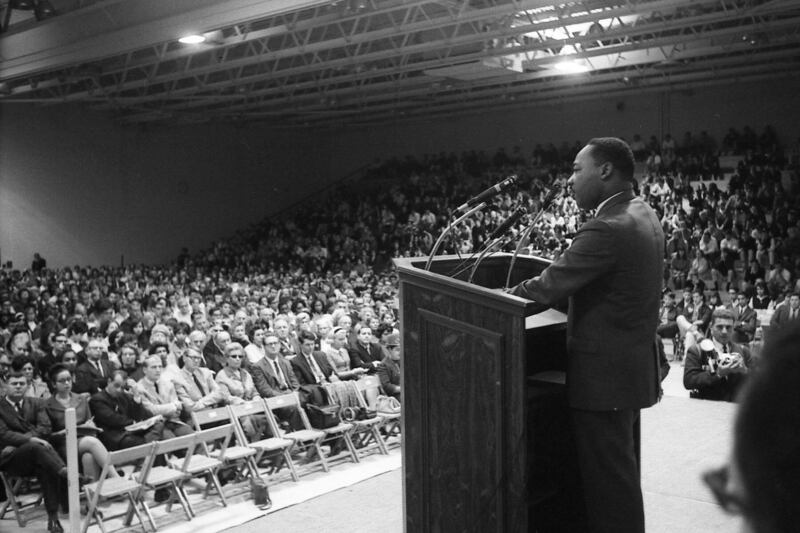 Beginning in 1966, King and the Southern Christian Leadership Conference embarked on an expansion of their push for civil rights from the South to the North. The central focus of the expansion was to end racial discrimination in housing, something Monmouth was dealing with as King visited. Just a day before his speech, students had occupied the president’s office to protest that two of the houses on the college’s list of approved off-campus dwellings were owned by landlords who would not rent to African Americans. Blocking the way was the issue of housing, one of the main planks of King’s speech at Monmouth, as well as the disadvantages in the workforce and “de facto” segregation in public schools that African Americans faced. King had already voiced his objection to the Vietnam War, and now was calling for the country to spend $10 billion a year over the next decade on improving housing and helping lift minorities out of poverty—a small sum, in his view, compared to the $24 billion being spent annually on the war at the time. Yet King’s speech was suffused with optimism and a faith that “we will be able to transform the jangling discords of our nation into a beautiful symphony of brotherhood.” And though he drew initial disapproval from some in the crowd, by the end he had seized his audience and, for many students, emboldened them to take up his cause. 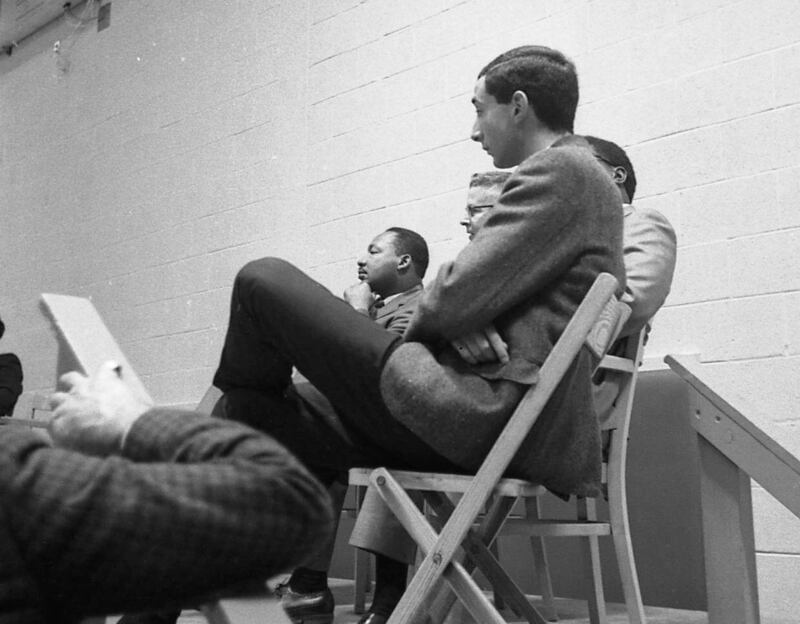 Michael Dadd ’68 (seated in the foreground in the photo above) died in May 2015, but he told the Asbury Park Press in 1992 that he had received hate mail for his involvement with inviting King to speak on campus. His obituary noted that he was “honored to have served as the student host” for the civil rights leader. Diane Boynton was a social worker in Red Bank at the time, and many of her clients were African American. Bill Frantz ’64, then Monmouth’s assistant director of student affairs, helped coordinate King’s visit and was part of the group that escorted King from the airport to campus. Greason says King left more of an impression through his mere presence in the context of his pursuit of justice than for the words he spoke on campus. “His commitment to the principle of love not being an idea, but being a practice—that if we really commit to how we connect with one another, how we listen to each other, how we improve each other’s lives in measurable ways, that to me is what King is about,” says Greason. Yet that message has recently seemed all but lost. In the span of just a few weeks this past summer, the country became a “tinderbox,” as Frantz put it, with a series of deadly shootings of black men by police. In the fallout of the violence, officers in Dallas, Texas, and Baton Rouge, Louisiana, were targeted and killed by black men, not only putting the nation on edge but also driving a wedge into the presidential race. But Mancini adds that now, just as much as 50 years ago, King’s words ring true. Editor’s note: Special thanks to Chris Ellwood, archives collection manager, for his assistance with this article.